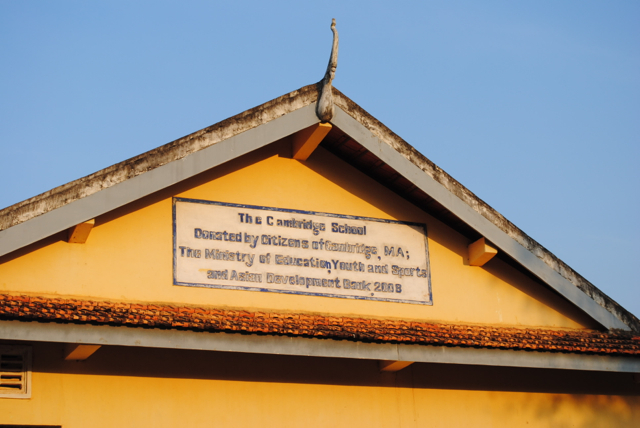 Welcome to the Cambridge Cambodia School Project! We are a volunteer community learning about Cambodian students and how to best support the education of middle school students in rural Cambodia at the school we built in 2008: “The Cambridge Cambodia School.” The project grew out of a global awareness program in the Cambridge public schools and is now supported by many different Boston-area communities. We welcome you to join our efforts to grow this educational two-way street: our Boston students become enriched, as do our friends in rural Cambodia. Our volunteer staff is listed here. Learn more about our Corporate Sponsors here. Please email us at cambcambodia@gmail.com if you want to help out! Where is our school? It is in the village of Kauk Rovieng, Kampong Cham province, 65 km from Phnom Penh, a 1.5 hour drive. The famous Angkor Wat Temples in Siem Reap are 5 hours away by car. How did we do this? The project spread “word of Mom” through Cambridge, MA and was made possible by a network of citizens collaborating together. We are the 405th school built by The World Assistance for Cambodia, an American family non-profit led by Bernie Krisher and his daughter, Debbie Krisher-Steele: www.cambodiaschools.com.